Breakdown: We've already talked about this being a down year for the 4x800m, but no chart is as sharp as the one here. 2018 saw two stellar teams in Northport and Saint Anthony's at this distance, and we're nearly 15-seconds off where they were a year ago. Not only that, but the tenth place team is way off as well. Now, there is still time to turn the ship around. But there have only been four years in the past decade that saw the depth of field above 8mins, and we might be adding to the list in 2019. 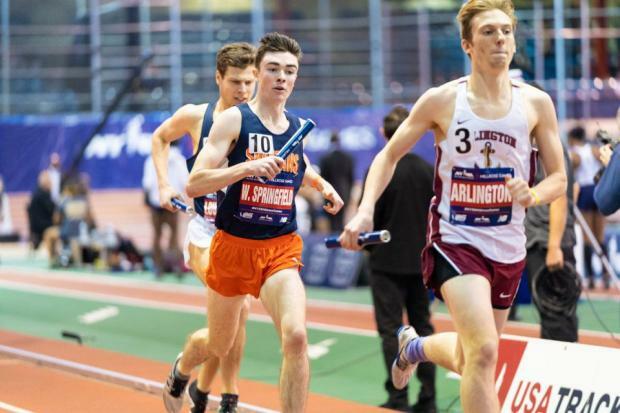 Update: We saw some redemption at the Millrose Games, as Arlington broke 8mins for the first time this year, and brought the top time to 7:53.66. It's still the slowest time in a decade, but at least it hedges us closer to where we need to be, and distance relays get fastest as the season goes on, more so than the sprints. Tenth place is still 8:08.31, so the rest of the State needs to keep up. Breakdown: Much like the boys, there is a sharp incline in 2019. 2016 and 2017 were in line with some of best years ever, and even the 9:10 by Manlius in 2018 was respectable. But the trend ticks upward, and it's tough to pick out a clear favorite this year. Likewise, the depth isn't there, as 9:36 for tenth in the State is about 10-seconds higher than ever before. Update: Shenendehowa dropped their season best to 9:18.11 at the Millrose Games, while Ursuline ran 9:26 without their 2:08 leg, who was in the mile. Sub her in, and they'd be looking at 9:07, right in the running with the past few years top marks.